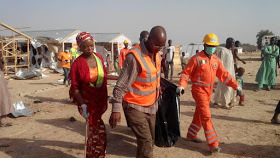 No fewer than 4 people were killed and eleven others were injured this morning in three seperate suicide attacks in Maiduguri. 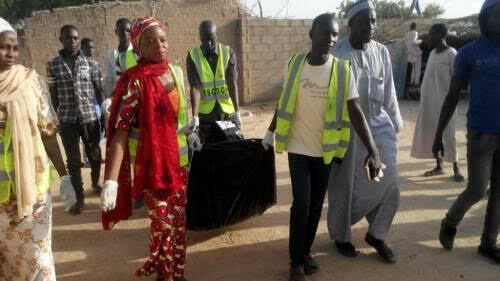 The suicide bombers carried out their attacks at different times in three different locations in Muna. Chairman of Borno State Emergency Management Agency (BASEMA), Mr Ahmed Satomi, disclosed this to journalists. According to him, a male bomber attacked Malakalerri area of Muna Garage in Mafa Local Government Area at about 4:18 am, killing one CJTF member and injuring five women and one CJTF member. 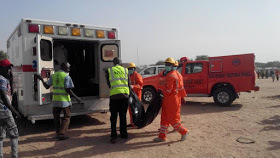 Seven minutes later, a female bomber blew herself up near Alkomi Clinic along Gomboru-Ngala Road, Sahara Reporters report. 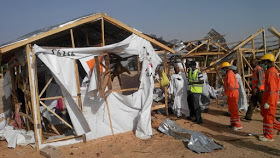 He also revealed that another female bomber attacked an unofficial Internally Displaced Persons (IDP) camp in Muna Ethiopia General Area, injuring five persons, who are currently receiving treatment. It is believed that the third female bomber removed the explosive device on her body, dropped it at the scene, then fled before it exploded.